I am really pleased with how my quilt, High Road Low Road, finished. It started as a re-examination of the block and piecing technique that I used for Beacon, and morphed into something entirely new. And then I let myself play and have a lot of fun with the quilting. This is a very double sided quilt, in my opinion, and I love the way the back shows off both the quilting and the areas that I left un-quilted from the front. I used 5 of the pink and purple fabrics used to piece the quilt top for a somewhat scrappy binding. The finished flimsy measured 48.5 inches square, the quilt top finished at 48 inches square after quilting, squaring, and binding, and the quilt measured 45.5 inches after first wash. I used 50wt Aurifil 2535 (Magenta) for the quilting, and I am really pleased with how well it allows the quilting to show without completely overwhelming the quilt top or design. I started at the top with a blowing wind motif and worked my way down the quilt changing the quilting pattern until I finished with flowers. I tried to represent many of the elements that were part of the inspiration for the fabric pull (a beautiful spring day in Monterey Bay): sky, sea, flight path of birds / bees / insects, man-made hard lines and walking paths, and of course the flowers themselves. As I am writing up this post, I am struck that I have 2 other projects that use a very similar color palette, because at the time I made this fabric pull I thought it was pretty unusual for me. I suppose color inspiration and combinations can come in waves, right? I clearly had an orange phase a year or so ago. I will be linking up with Finish It Friday. Lovely. I am in an orange/pink phase now! I can’t control it. Yvonne, Great finish! Your quilting is beautiful! My favorite row is second from the the bottom, the pipeline design. Was it difficult to accomplish the hard corners freehand? Beautiful! The quilting shows up so well on the back, you really made a wonderful two sided quilt! I love this quilt, Yvonne. There is a whole bunch of fun packed into this 45″ square. 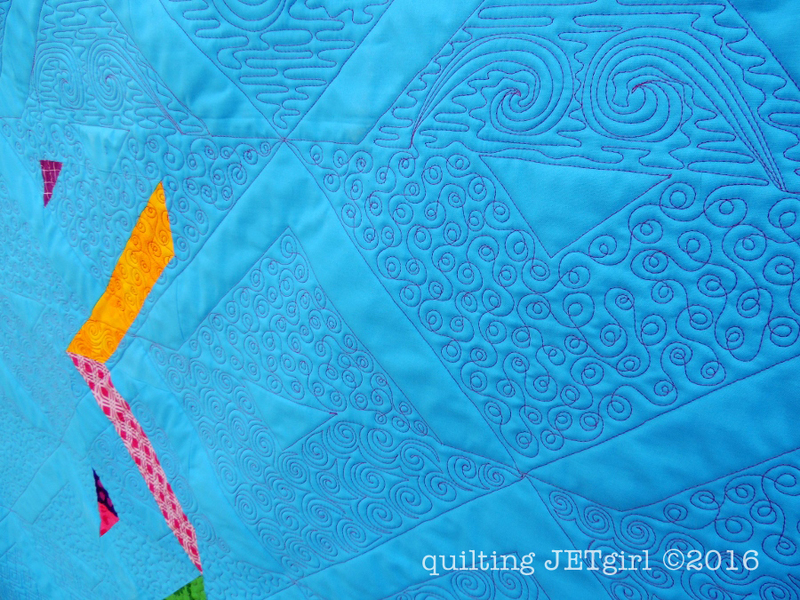 I love that you used the magenta thread against the blue, it really shows off all the fun quilting. And the back is like it’s own separate design. Lovely, Yvonne. I love the negative space of the blue paired with the patterned fabrics you chose. wow that looks awesome, I really love how you played with the quilting, it really gives it some cool dimension. This is so gorgeous – I love the colours you chose! 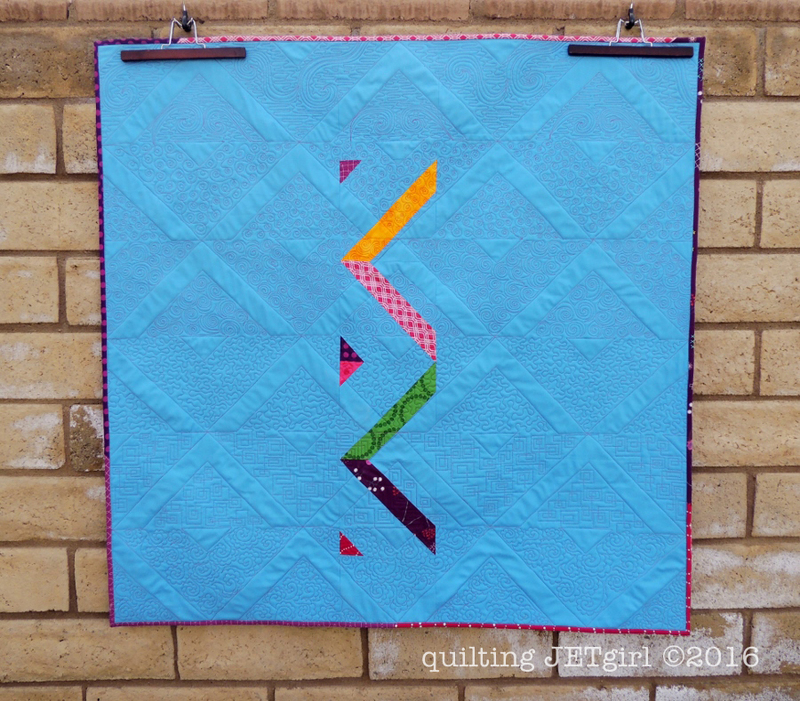 I also really like the different types of quilting in each row – looks awesome! I’m really pleased with this, too! 😉 I like the sort of 3-D effect it has. If you make a pattern for this, I think you will have great success with it! I love the colour combination in this quilt. The green and yellow really make it. Great job showing us the quilting as well. I’m really drawn to the boxy squares as I am hoping to use that design in a quilt later this month myself. It’s gorgeous, Yvonne! I agree that the thread strikes just the right note so that it neither blends in nor overpowers. Great choice, and great quilting. The quilting is pretty great! And I love that it is totally a double sided quilt! Color goes in waves for me too! Crazy how that happens!! so much fun in one quilt! I really like the back too and the quilting suits really well! So fantastic! 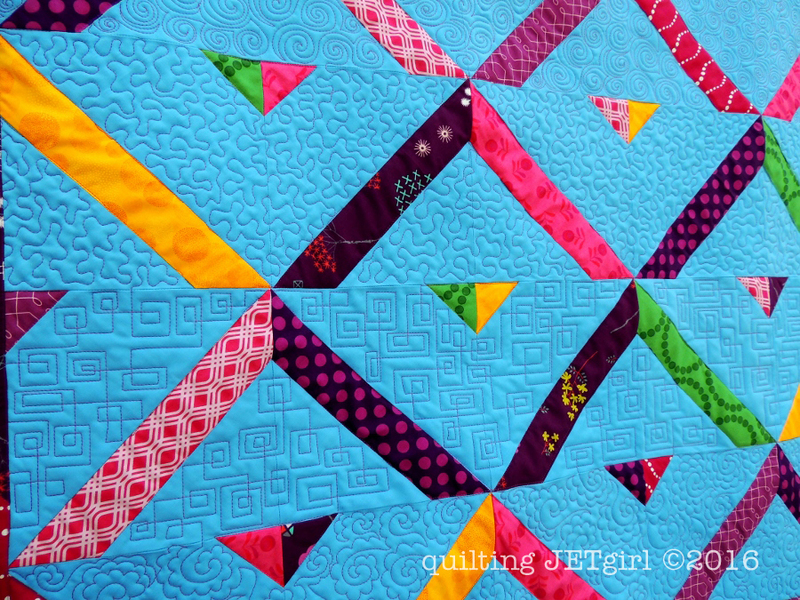 Love the quilting, such a fun one! Great quilt! I love both front and back! Your designs are unique, fresh, and colorful. I always like them! Thanks for sharing with us. This is cool! I like all the different quilting motifs and the back is awesome! 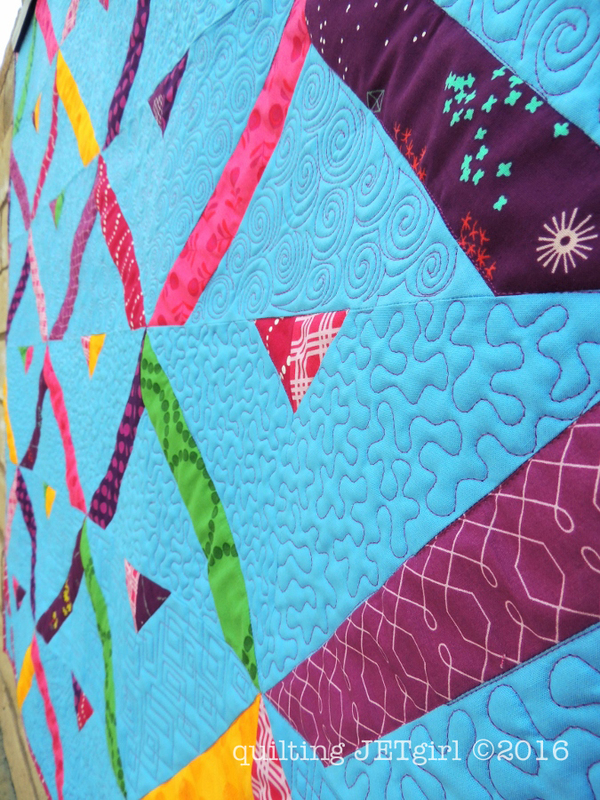 I love the bright colors, but I love all your quilting even more. What a great quilt. I love the quilting on this. I never would have thought to pair magenta thread on the blue but it looks fantastic! oh man the back looks awesome! Looks like the whole quilt was fun to make! 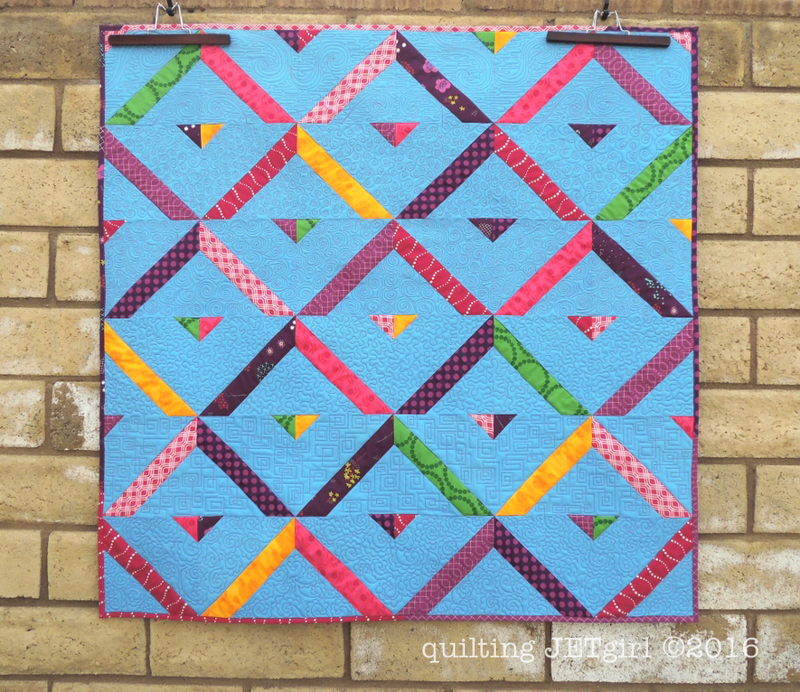 High Road Low Road – what a perfect name and a fun quilt! The tones in all those colors look perfect set against that particular blue. It really is a two sided quilt – the quilting you did is so beautiful Yvonne! I particularly love that Geometric meander and would love to give that a try. It has a 1950s vibe to it. Wow, the quilting in that thread looks amazing on this one, particularly on the back. And I like the idea of colour inspiration/combinations coming in waves. Do you think design ideas do too?